Wow! Award-winning journalist Mac McClelland's autobiography of her battle with PTSD, which she has as a result of events she witnessed when on assignment in Haiti, just hit me between the eyes. It is such a personal and painful account from a young, highly intelligent woman's heart that I have an entirely new empathy for the flash-backs, night terrors and brutal fantasies she and so many sufferers experience. The book is her most difficult assignment of all: delving into her own broken psyche in an attempt to cure herself. This is an important book about a very current topic. Do yourself a favor and read Irritable Hearts. It will do yours a world of good! In 2010, human rights reporter Mac McClelland left Haiti after covering the lingering devastation of the earthquake. Back home, McClelland finds herself imagining vivid scenes of violence. She can't sleep or stop crying. It becomes clear that she is suffering from Post-Traumatic Stress Disorder, triggered by her trip and seemingly exacerbated by her experiences in the other charged places she'd reported from, places where she thought she'd escaped emotionally unscathed. The bewilderment about this sudden loss of self-control is magnified by her feelings for Nico, a French soldier she met in Haiti who despite their brief connection seems to have found a place in her confused heart. With inspiring fearlessness, McClelland sets out to repair her broken psyche. Investigating her own illness and the history of PTSD, she discovers she is not alone: traumatic events have sweeping influence. While we most often connect it to veterans, PTSD is more often caused by other manner of trauma, and can even be contagious--close proximity to those afflicted can trigger it in those around them. As McClelland confronts the realities of her disorder, she learns to open her heart to the love that seems to have found her at an inopportune moment. 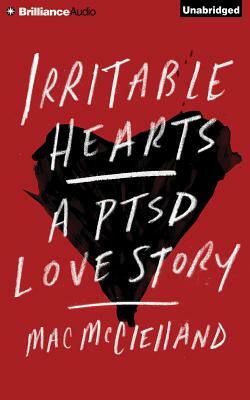 Vivid, suspenseful, and intimate, Irritable Hearts is an unforgettable exploration of vulnerability and resilience, control and acceptance, and a compelling story of survival that expands the definition of what trauma is and offers powerful hope for those who need to work through it.